Wayúu Women’s Force is among the indigenous community groups subject to a series of death threats by far-right Colombian paramilitary groups known as Águilas Negras. Leaflets were scattered along the railroad by which coal is transported from Cerrejón, Colombia’s largest open-cast coal mine. The mine, located in La Guajira, is owned in equal share by Anglo-American, Glencore and BHP Billiton, and the coal is imported into the UK. 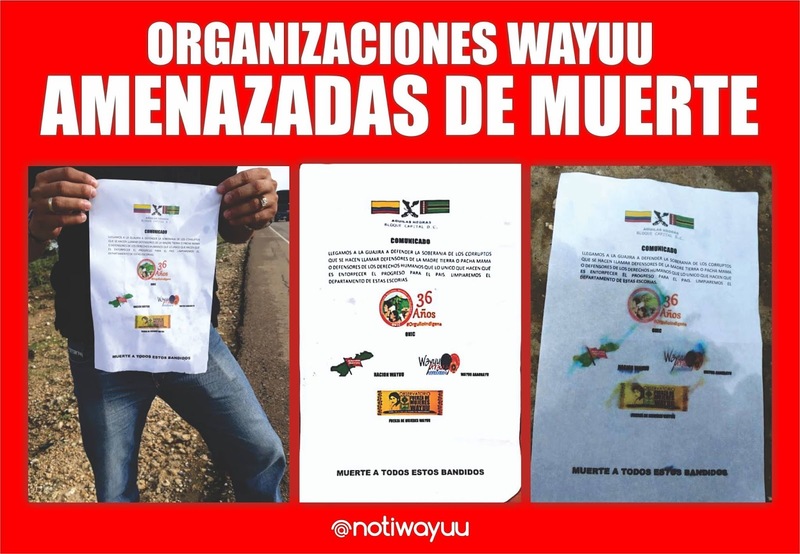 In response, our partner organisation Wayúu Womens Force, an indigenous community campaign dedicated to defending the rights of the Wayúu indigenous people, have requested urgent protection from the Inter-American Commission on Human Rights and call on the Colombian government to protect them. Wayúu land defenders have previously been forced to flee Colombia due to threats against their lives. Visiting defenders including Misael Ipuana will be available for media interviews and we will holding a series of events throughout next week, including a demonstration on 17 October outside the BHP annual general meeting. The #BeyondBHP week of action is co-organised by London Mining Network, The Gaia Foundation, War on Want, Colombia Solidarity Campaign, ThreePenny Festival Collective and Coal Action Network. Latin America Conference 2017 - Free Trade Imperialism and Resistance!